The SB2271SG combines leading edge technology with super high 12-bit (4096) resolution and full aluminum gears for one amazing servo! This servo uses a brushless motor providing high speed, incredible efficiency, and low power consumption. The extremely strong aluminum gears ensure long-life and durability. High-voltage-capable for running direct LiPo receiver packs. Ideal for rock crawlers and steering servo on 1/8-scale buggies. 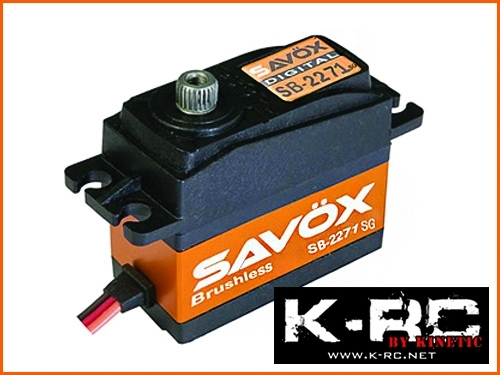 Brushless motor provides high speed and torque, incredible efficiency, and amazingly low power consumption. Ideal for rock crawlers, monster trucks, every control surface for giant scale aircraft, and 700 class heli cyclic.